Buffalo nickels and loaves of bread. And pennies and cabbage, too. 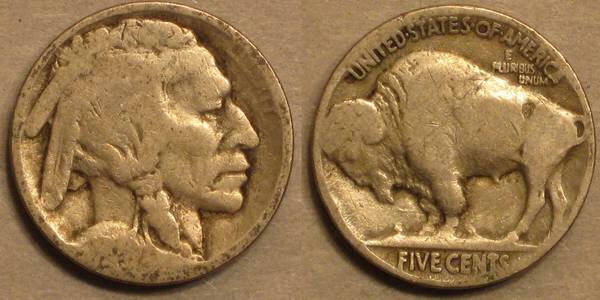 Yesterday I was given a buffalo nickel in a handful of change. Of all things! A buffalo nickel! These were minted between 1913 and 1938, and though the date on mine has been completely worn away, meaning I’ll never know when it was struck, I do know that it was certainly no later than 1938 — at which time, apparently, a nickel would have bought you a jumbo loaf of sliced bread (at a time when being able to afford a jumbo loaf of anything was hardly a foregone conclusion). Anyway – I have some pretty powerful feelings about old coins! And I wrote about them once. Hereunder, that post. I have this odd little habit. It’s harmless, but also seemingly pointless. Every once and a while I stop and wonder: Why is that again? I collect what are known as wheat head pennies. And when I say “collect,” I mean rather as the girl collects the sticks to all the lolly pops she’s every had — there’s no real organization to it, certainly no rarefied treatment afforded, and I don’t really imagine that I’ll be doing anything with them in the future. I just like having them. The wheat head penny, you see, was discontinued in 1959, when the wreath of wheat was replaced with an image of the Lincoln Memorial. If I hold a wheat head penny in my hand, it was first in someone’s pocket at least five years before I was born. My collection is small — only 16, so far — the oldest minted in 1924, most in the 1950s. The boy knows to keep an eye out for them. If, for instance, we see-a-penny-and-pick-it-up-and-all-the-day-you’ll-have-good-luck, we take a good look to make sure it isn’t super old. I don’t much like how they smell — pennies were bronze in those years — and if I hold them for too long, my hands will stink for the rest of the day. But holding them is kind of what I like the most. 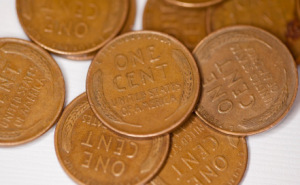 These pennies made a real difference in real people’s lives. In the 1920s, you could get a pound of cabbage or watermelon with just two of them, and in 1932, a pound of wieners cost eight (meaning, if the 1932 wieners were roughly the same size as the wieners currently in my freezer, you could get two for just one of my pennies). If I were to hop into my time machine with the sixteen wheat heads currently in my possession and head for 1946, I would be able to buy a dozen doughnuts, with one penny left as a souvenir (but of course I wouldn’t collect any more while there, because: Prime Directive). By the time the wheat head was discontinued, each individual penny carried a bit less of a wallop, but hey: With only 10, you could buy a Jiffy cake mix for your end-of-decade bash! I like to think of the kids who were given these pennies in their stockings, about the woman who dropped them into coin purses or coffee cans in kitchen cupboards — real money, money that you counted and horded and made important decisions with. Something simple and daily that passed through hands and pockets and tills without number, until they came to find me, and I put them in my pocket, and then into a little bag, in a little box, on my dresser. The day will come, I imagine, that my children will have to decide what to do with them. (“Do you want Mom’s pennies?” “Why’d she collect these again?” “I don’t know…”). I’d like to say I hope they feel free to get rid of them, but honestly? I hope they don’t. Maybe they’ll split the collection between them, or share with their own kids. Of all the many objects we gather in an effort to preserve our history, it’s these sorts of things that I love the most — the little things. The things that people actually touched and used, carried with them into their day. I imagine some of my wheat heads have sad stories to tell as well: The boy who couldn’t buy the longed-for movie ticket, because my 1927 penny rolled under his bureau and he couldn’t see it. Or the tired waitress met by a surly customer, who thought leaving a one-penny tip might be funny. It’s not all piggy-banks and coffee cans when you’re a penny. But that’s real, too. I like feeling that somehow, even without knowing the potentially millions of stories each of these coins could tell, I am still holding those stories safe, and — somehow — remembering. On boys and princesses (and Barbies). If you’ve tried to email me. Seventy-five years ago, when my father was a child, he collected Indian head pennies. Those are worth some money now. When I was young, one could still find the occasional Mercury dime in one’s change. On a related note, pennies prior to 1982 that are all copper, are worth enough for the copper that one copper miner started buying them up, sorting out the pre-1982 pennies, and melting them down, because it was more cost-effective than actually mining the stuff. He got caught and the Feds made him stop, though. I’m in the UK and some of our old money is worth a FORTUNE now. Keep it! Oh! What a lovely post. TYSM. I found a brand new shiny 2005 penny in the parking lot of a book store the year my ex and I split up. It seemed like a good omen, so I put it on my charm bracelet, along with other charming treasures from around the world…. I *still* haven’t been able to find the name of the typeface on the wheat penny. I would love to have a full set (what’s the proper word for all characters in a typeface?). Also pennies: for a brief period before they went from all copper to copper plated, they were minted thinner than previous pennies (1980? 1981?) to save on copper. I remember sitting with some friends lamenting not having calipers to see if the new pennies were indeed thinner. Then someone had the bright idea of making stacks of 10 and comparing the heights of each stack. Some old coins buy the same old thing. In 1913, a $20 gold piece would buy a very high quality men’s or women’s suit. In 2013, a $20 gold piece would by…..a very high quality suit! I do this! I was a little kid when the wheatbacks disappeared and whenever I see one it takes me back to when getting a penny was a big deal! Have a pile of them somewhere. Mercury dimes too, but saw waaay fewer of them.